Rance Landscapes as experienced Driveway Paving Contractors with a good track record of carefully and professionally installing block paved driveways enhancing properties across Hertfordshire and surrounding areas. Our customers benefit from our knowledge and are provided with clear and concise advice about whether driveway paving is suitable for their property. Is a paved driveway a viable investment? Choice of colours and designs? Is it really a low maintenance surface? 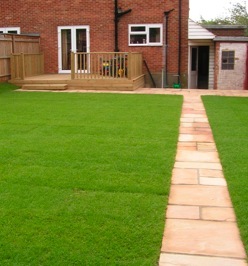 Rance Landscapes do not adopt an "all size fits all" approach to our work; rather we carefully consider all of the important aspects associated with installing a new driveway. We start with a site survey and then move on aspects such as the defining the function, shape and size, your tastes, available budget, requirements for kerbings and edgings, lighting, local area and the all important technical topics such as drainage and recess covers. As expert Driveway Paving Contractors, Rance Landscapes will offer you advice on all aspects of planning, designing and installing your new driveway. In effect, we will ensure that you choose what matches you property and your budget. We appreciate that you are making an investment in your property and will want a finished result that meets requirements. Engaging Rance Landscapes as your Driveway Paving Contractors will provide you with the services of an experienced Landscape Gardening company who has built a solid reputation for delivering pleasing and high quality paved driveway finishes. We look forward to your hearing from you in our role as Driveway Paving Contractors to discuss the possibilities for your property. We also offer a cost effective and efficient garden maintenance service to residential customers. Please contact us for a free quotation.